I think that my favorite hero of the faith of the Old Testament is David - the man after God's own heart. I love to read about him and the relationship he had with the Lord. I have other heroes of the Old Testament too; Enoch, Abraham, Joseph, Daniel, Moses and the prophets Elijah and Elisha, and many more. However, I find that I identify with David the most. Perhaps it is because he was a worshipper and a psalmist. I can relate to that. He wanted to know God intimately and to bless Him. David was also a shepherd, an armor bearer, a man of war, and a king. He went from feeding his father's flocks to leading the nation that God had called unto Himself. Although he made some huge mistakes in his life, the priority of his relationship with God never changed. Even after incredible sin, he found redemption and forgiveness, and God still called him a man after His own heart. I have to believe that this relationship started when he was a lad caring for his father’s flocks. David must have spent long hours playing and singing and worshiping the Lord as he shepherded the flock. He became a skillful minstrel and psalmist as he developed his intimate relationship with the Lord. When we first meet David he was more than likely a teenager – ruddy and young. Saul had been rejected by God as king, and Samuel was on a mission to find the next king of Israel. You may recall that Israel had begged God for a king, and Samuel the prophet had tried to plead with them to understand that God was their king, but their voices prevailed. The people rejected God and wanted to be like the other nations. So God chose Saul. He was handsome and a head taller than any of the people, but unfortunately, like most of us, he had some character flaws… one of those flaws was fear. The day Samuel anointed him as king, he was found hiding among the stuff. After just two years of reigning over Israel, he went against the word of the prophet Samuel and offered a burnt offering - which was not his job. That was the job of Samuel the prophet. Just as he completed the offering, Samuel came and proclaimed the judgment of God on Saul. 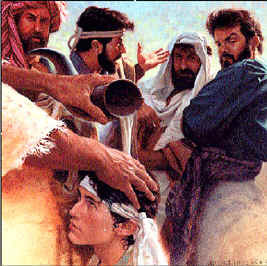 Even after this, Saul rebels again, and fails to obey the Lord as he was commanded. Samuel has to once again confront him, and the Lord tells Samuel, "I greatly regrest that I have set up Saul as king, for he has turned back from following Me, and has not performed My commandments." It grieved Samuel and he wept all that night long. The next day he delivers the devastating news to Saul of God’s rejection of him as king. Samuel clandestinely (for fear of Saul) goes to David’s home town of Bethlehem, to the house of David's father Jesse, of the tribe of Judah to anoint a king. In those days, it was not a light thing for a prophet of God to come and visit a town. It was especially not a small thing that the prophet Samuel had come to town. Samuel was the prophet that God promised to not let any of his words hit the ground. In other words, he spoke as an oracle of God. When he spoke, it was the word of the Lord, and what he said came to pass. At his word Israel trembled. In fact, when he enters Bethlehem, the elders of the city ask him if he came there peaceably! So this is a BIG deal! There was something about David's heart that pleased the Lord. God saw something in David that He really liked. So much so, that He called Him a man after His own heart, and told Samuel to anoint him as King of Israel. Suddenly someone from your father’s house comes running and tells you that Samuel the Prophet has come and needs to see you immediately - Yikes! As David walked in front of Samuel, and the Lord tells Samuel, this is the one! David's life changed from that moment on.